New York:: Amistad / HarperCollins, , (2003.). Fine in fine dust jacket.. First printing. Winner of the Pulitzer Prize and the National Book Critics Award, a finalist for the National Book Award, this is a book that truly deserves all of the acclaim it has received. The story of free colored slaveholders in 1840's Virginia is both historically accurate and moving. Author Jeffrey Lent called this "a modern masterpiece that staggers the imagination...the most powerful and deeply realized novel I've read in a long time. This is a work that transforms and transports to such a thorough degree that when you finally step out 'The Known World,' you're shaken and turned around, never again to be the same. This novel is what literature can and should be.' 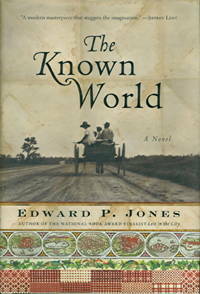 Cover featuring a Eudora Welty photograph. 388 pp. Went quickly into later printings and rather uncommon in the true first.